"Control a virtual simulated family inside your computer in Virtual Families 2." 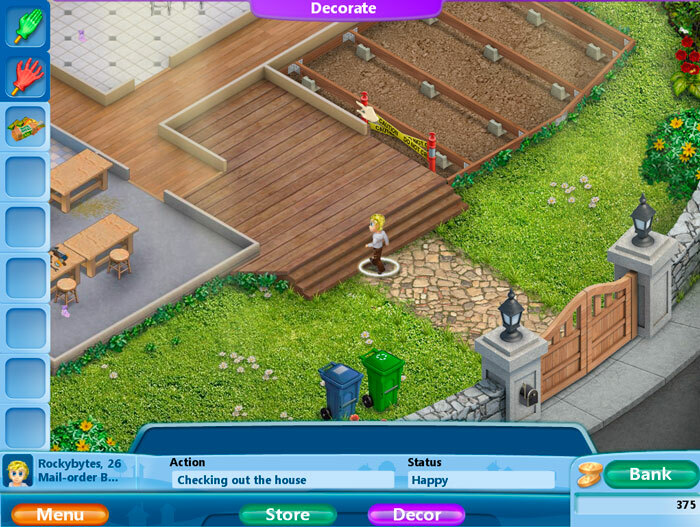 Do you like simulation games like the Sims? Virtual Families 2 is a lot like the Sims, but it is a lot more simple and can run on just about any PC out there. It isn't a very demanding games, and that is what sets it aside from more advanced games like the Sims. It's also a whole lot cheaper, but you can try out the game right here on Rocky Bytes for absolutely free by downloading this demo. There's tons of great things you can do in Virtual Families 2. Just a few of the great things you can do are expand and renovate houses, customize all the rooms in the houses, shop for tons of items for your house, tons of upgrades, collectibles, and more! The game also features real-time game play and fully trainable people in the game. This means you can teach your families just about anything that will benefit them in Virtual Families 2. The music in the game is also pretty catchy at first, but can also be very repetitive. Luckily, you can turn this off if you'd like while you play the game. In the second version of Virtual Families, there is also pets that your families can adopt to make your home life just a little bit more lively. With a ton of random events to play through and counter, you will go through life with your virtual family as they grow and become happier and more successful.